MLB Chicago Cubs Baby Boy Doll: Born A Cubs Fan by Ashton Drake. Celebrate your favorite MLB team with this collectible Chicago Cubs fan baby boy doll by renowned doll artist Cheryl Hill, available from The Ashton-Drake Galleries. Officially licensed by Major League Baseball Properties. Handcrafted in baby-soft vinyl and hand-painted, with delicate eyelashes and perfectly sculpted little fingers and toes. He naps fortably in a baseball glove that's just his size. Description You know you were born a Cubs fan if you bleed Cubbies blue, you wish every day were game day and when you sleep, you sleep with a baseball glove - or, in this little guy's case, inside it! Catch the most adorable MLB collectible ever with this Chicago Cubs baby boy doll, available from The Ashton-Drake Galleries. Renowned doll artist Cheryl Hill has created this precious little sleepyhead to be amazingly lifelike, and he's officially licensed by Major League Baseball Properties so you know he's authentically Cubs from head to toe. Dressed just as a Cubs fan his age might be, in a one-piece sleeper patterned after the Cubs famous uniform with the team logo on the chest and a matching cap. This adorable Cubs collectible baby doll is handcrafted in baby-soft vinyl and hand-painted, with delicate eyelashes and perfectly sculpted little fingers and toes. 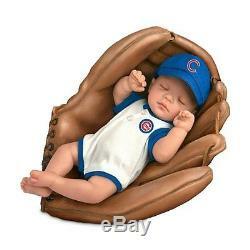 Best of all, this little Cubs fan naps fortably in a baseball glove that's just his size! He makes a fan-tastic addition to your own MLB memorabilia or an out-of-the-park gift for any Chicago Cubs fan. High demand is expected, so don't wait. Acpanied with a Certificate authenticating your doll is an original from The Ashton-Drake Galleries. Measures approximately 10 L; 25.4 cm L. Providing quality products and service. Blue Marble is the United States supplier of high quality products. We provide our customers with quality products and services. Each one of our products es directly from the manufacture each of whom adhere to quality control system and quality assessment, along with adhering to all international safety and standards in place. Our corporate spirit and reputation is what allows us to serve our customers so well, providing the best prices and products to retail stores and customers located all over the United States. We look forward to working with you! We will be gladly to help you with our best of knowledge. Once you have received your item, please leave feedback for us as this will inform us that you have received your items. The item "NEW MLB Chicago Cubs Baby Boy Doll Born A Cubs Fan by Ashton Drake" is in sale since Monday, June 01, 2015. This item is in the category "Dolls & Bears\Dolls\By Brand, Company, Character\Ashton Drake\So Truly Real". The seller is "bluemarbleproducts" and is located in 33148. This item can be shipped to United States.